This is how Letitia Baldrige Hollensteiner, White House Social Secretary to President John Fitzgerald Kennedy, remembered the preparations for JFK’s visit to Ireland in June 1963. It would be the first time a serving U.S. President would visit Ireland, and his address to the Irish Parliament in Dáil Éireann would be the first occasion on which television cameras would be allowed to film an event there. Clearly the President needed to bring an extra special gift. The flag that Letitia Baldrige Hollensteiner had sourced was the second green color of the 69th New York, the first Regiment of the Irish Brigade. By late 1862, the original colors which had been presented to the Regiments of the Irish Brigade in 1861 were in tatters, and badly needed replacement. The new flags were sponsored by New York merchants and consisted of one green flag and one national color per Regiment. They became known as the ‘Tiffany’ Colors as they were manufactured by Tiffany and Company. Although they were officially presented to representatives of the Brigade by Henry F. Spaulding in early December, they had not yet arrived at the front when the Irish Brigade made its famous charge against Marye’s Heights in Fredericksburg on 13th December. It is somewhat ironic that the new flags arrived in Fredericksburg immediately after the Brigade had been effectively annihilated charging the Stone Wall. Indeed the Irish appropriated the theatre in Fredericksburg to have a reception for the colors, despite the fact that the town remained under fire. The banquet was attended by General Hancock, who noted that ‘Only Irishmen could enjoy themselves thus.’ (2) The flags were returned to New York to await the Brigade’s return to full strength; however it was destined never to recover from the losses sustained at Fredericksburg. As a result, the colors never saw battle, though they were used during the Grand Review in 1865 (3). The Brigade’s 1st Regiment green color remained in the Armory of the 69th in New York, until in 1963 they kindly permitted President Kennedy to present it to the people of Ireland. Mr. Speaker, Prime Minister, Members of the Parliament: I am grateful for your welcome and for that of your countrymen. Of the 1,200 men who took part in that assault, 280 survived the battle. The Irish Brigade was led into battle on that occasion by Brigadier General Thomas F. Meagher, who had participated in the unsuccessful Irish uprising of 1848, was captured by the British and sent in a prison ship to Australia, from whence he finally came to America. In the fall of 1862, after serving with distinction and gallantry in some of the toughest fighting of this most bloody struggle, the Irish Brigade was presented with a new set of flags. 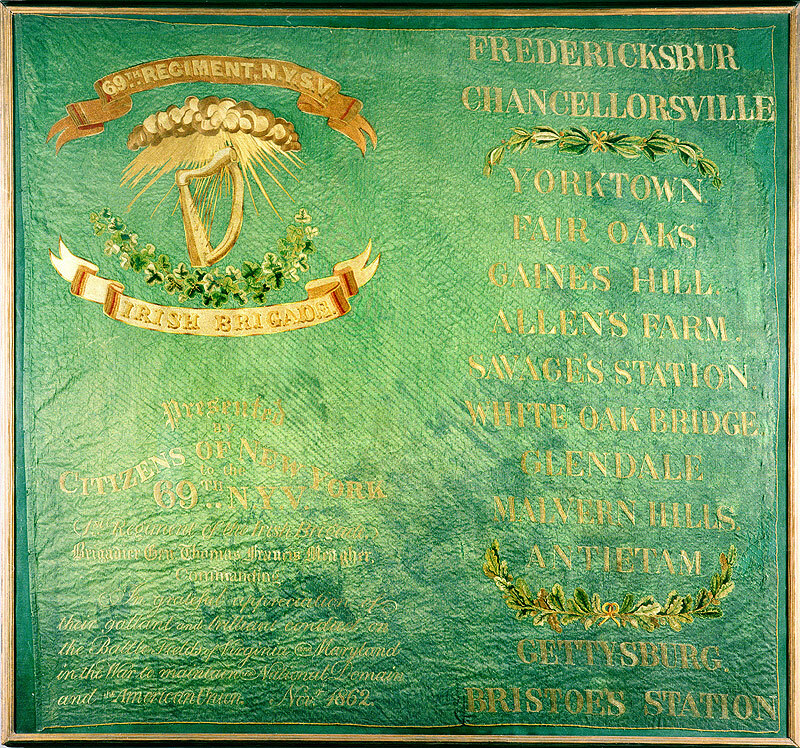 In the city ceremony, the city chamberlain gave them the motto “The Union, our Country, and Ireland Forever.” Their old ones having been torn to shreds by bullets in previous battles, Captain Richard McGee took possession of these flags on September 2nd in New York City and arrived with them at the Battle of Fredericksburg and carried them in the battle. Today, in recognition of what these gallant Irishmen and what millions of other Irish have done for my country, and through the generosity of the Fighting 69th, I would like to present one of these flags to the people of Ireland. As you can see, gentlemen, the battle honours of the Brigade include Fredericksburg, Chancellorsville, Yorktown, Fair Oaks, Gaines Hill, Allen’s Farm, Savage’s Station, White Oak Bridge, Glendale, Malvern Hills, Antietam, Gettysburg, and Bristoe’s Station. The Irish contribution to the American Civil War was of course a natural starting point for such an important speech by the President of the United States. The flag remains the most significant object relating to the Irish experience of the American Civil War in Ireland. Following the President’s visit, the flag was hung in Dáil Éireann, where it remains today. It is deeply unfortunate that the flag is located in the Parliament building, where visiting is restricted and its exposure to the general Irish population is low. A far more appropriate location would be in one of the Country’s national institutions, such as the National Museum of Ireland. Such a setting would allow the flag to be interpreted and presented in a way which would enable the Irish people to learn more about their forebears contribution during the Civil War. It would also ensure the flags survival for future generations, as it could be regularly monitored by conservators and displayed in climate controlled conditions. The upcoming 150th anniversary of the American Civil War provides an ideal opportunity for the flag to become more publicly accessible to the people of Ireland. Letitia Baldrige Hollensteiner, recorded interview by Mrs. Wayne Fredericks, April 24, 1964, (19), John F. Kennedy Library Oral History Program. So – what can ordinary people do to begin a campaign to have the flag placed in the safe hands of the National Museum of Ireland ? Well I was going to get in touch with the Arts, Sports & Tourism spokespeople of the main political parties and also the Ceann Comhairle to see if something can be done about it. Very good – their contact addresses would be very helpful ! The Trans Atlantic writing team of Craig L Barry (Murfreesboro TN, USA) and David Burt (Congleton, Cheshire, England) publish their new book on the Irish firm of Peter Tait & Co, of Limerick, Ireland and their efforts to supply the Confederate States of America with uniforms during the latter part of American Civil War. This is also the story of Peter Tait the man, a remarkable entrepreneur and his invention of a new way to make military clothing. The book gives the story of Tait from his beginnings as a “Hawker” peddling shirts from a basket in Limerick to his setting up the biggest ready made clothing factory in the world. It also tells the story of Peter’s brother James L. Tait and his attempts to deal with the Confederate Government and individual states. It provides details of all the existing Confederate “Tait” jackets in museums and private collections, with exclusive photographs of most of the jackets examined. Also included is new evidence that not all so called “Tait” jackets that still exist were made by Tait & Co, but that some must have been made by another uniform manufacturer, namely Hebbert & Co of London. Information is also given on Tait and Hebbert buttons, detailed uniform studies including sections on original epaulettes and ‘Tait trousers.’ The book also examines Tait’s relationship with the notorious Alexander Collie and their purchase of a blockade runner to run the uniforms in to the Confederacy. There are detailed appendices, including information on all the blockade runners and detailed cargo manifests including arrival dates and the numbers of uniforms shipped, to a description on the Limerick Clothing Factory. Other appendices are included on Tait’s family, his time as Mayor of Limerick, the Tait clock plus articles on Confederate uniforms, including the famed “blue grey kersey” and the dyes used in the making of the cloth for the Tait jackets. In short, this is the complete story of the man, his company, and his dealings with the Confederate States of America, leading to him becoming a major Supplier to the Confederacy. •	Available from Authors online or amazon.com amazon.co.uk WH Smith, Barnes & Noble or your local bookshop. •	Join the Burt and Barry Suppliers to the Confederacy Publications Group on Facebook. Thanks for the heads up on the new book! I will make sure to add it to the bibiography on the site and pick up a copy when it comes out. Peter Tait is a popular topic on this blog, so a book of this nature is most welcome. Excellent article, my friend. I will be in Fredericksburg next Monday (I always visit Fredericksburg near the anniversary of the battle). I will say a prayer for all the Irishmen that fell with the “sprig in their hats.” Those boys were a gallant bunch. Glad you liked it! All the Union men who braved the Heights that day having seen what was happening to those who had gone before were truly remarkable. It is difficult to comprehend how they found the bravery to do it. I hope at some stage to get the opportunity to make it to the battlefield myself, to see in person what they faced and to remember them. Lysy, Peter J. Blue for the Union & Green For Ireland: The Civil War Flags of the 63rd Regiment New York Volunteers, Irish Brigade. South Bend, IN: Mossberg and Company Inc., 2001. I haven’t managed to get my hands on a copy of that as yet, although I am hoping to pick one up soon- Jim over at Notre Dame in the Civil War (www.notredamecivilwar.blogspot.com) also had a recent post about it. Although it didnt feature in this post it is listed on the ‘Books’ page of the site -I am hoping eventually to get my hands on everything on the list! The 63rd Tiffany colors are another great example of the flags presented in December 1862. The Tait book will be out in Jan/Feb 2011. Myself and Craig Barry have been researching Tait & Co for several years, and especially their efforts to supply the Confederacy with uniforms. we have some fifty photos in there, and it will be available in a standard edition (B/W photos) and a full colour collectors edition. It will be the second book in the “supplier” series. The first being “Supplier to the Confederacy S Isaac Campbell & Co, London” available on amazon. I have added it to the books page of the site. It looks like a really exciting book, I am looking forward to it- I think I will have to go for the colour plates edition! Thanks very much Damian, very much appreciated. Has anyone found facts or a photo of the 88th New York regimental flag? I will have to check up on the 88th’s flag, in the meantime maybe one of the site’s readers might have some more information! There are photographs of the 88th flag in the book – Lysy, Peter J. Blue for the Union & Green For Ireland: The Civil War Flags of the 63rd Regiment New York Volunteers, Irish Brigade. South Bend, IN: Mossberg and Company Inc., 2001. I referenced the book earlier in this thread. Was reviewing this article again. Wonder what it was that caught JFK’s eye as being fishy – the interview doesn’t say. That the Tiffany flags saw battle? Unfortunately the interview dosent state what it was, but it would be great to know- it may well have been that or to do with the details of the battle- he obviously had an interest in the brigade’s history in anycase! What happened to the letter “G”? Upper right hand corner of the flag. That area had decayed away so has been restored with a green backing as I think some of the edges were frayed, but originally it did have the ‘g’. Interesting to see the Gal Gréine or Fenian Sunburst symbol on the flag (the sunrays descending from the cloud above the more traditional Harp). A useful reminder of the status and influence of the Fenian Brotherhood in the Irish-American communities of New York, Boston and Philadelphia both before and during the US Civil War. I’ve seen Sunburst iconography on several unit flags of the Union army but never the Confederate. I presume that reflects the lesser role of the Fenian Brotherhood in the South and in its military affairs? That is a good question, and I must admit I don’t recall coming across it on any Southern flags either. There were Confederate Fenians, but the nature of Irish service in the southern military did not lend itself to the same levels of organisation that the Fenians in the northern forces attained. Still I don’t think there has been much work carried out on Confederate Circles, and it is certainly something that is worth looking into in further detail. Most studies I’ve read suggest that the majority of Fenians sided with the Union cause (whatever their personal views about slavery, etc.) while only a minority went with the Confederate one. I suspect in small part that may be explainable by the relative lack of organisation by the Fenian Brotherhood in the South due to the lower concentrations of new Irish immigrants who tended to crowd the north-east cities and states. The Irish communities of the south tended to look to nationalists of the generation of John Mitchel, etc. rather than the more militant newer generation of Irish exiles, and seemed to be more “conservative” in terms of their nationalism. 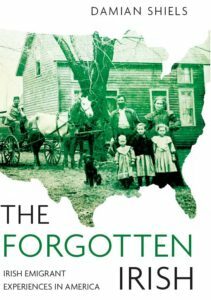 Unfortunately there is not much out there examining the experiences of the Irish-American communities of the southern US. Hoping to get my hands on Mitchell Snay’s book “Fenians, Freedmen, and Southern Whites: Race and Nationality in the Era of Reconstruction” which might have some details. Seamus, there’s also “The Irish in the South, 1815-1877” by David T. Gleeson; thought it very good. Thanks, Dennis, will look it up. On the Flags, I have seen a number of the 69th New york Flags at their HQ on Lexington Ave. NYC. The Prince Of wales Flag is in the Col. Office. Many other New york Regimental flags are up in Albany in the NYS Military Museum. On the Irish fighting for the south, a Southern Irish Regiment was lined up to fight the Irish at Fredricksburg. Gen Robert E. Lee sent a non Irish Regiment to re-enforce them, he didn’t have to. The Southern Irish shot down the Irish Brigade. Note the Fighting 69th came closest to the wall. Have a son a 1st Lt. in the 69th N.Y.N.G. we take trips to walk the fields. The Antietam web site is Maryland My Maryland, Sept 8th 2012. I forget the 150 site for this December at Fredricksburg, but I hear the present day Fighting 69th will be involved. Our rooms are booked already. Many thanks for the comment- would love to see the flags in New York some day!